This unique volume examines the life and thought of Basil of Caesarea. Stephen M. Hildebrand brings together a lengthy introduction to his life and thought with a selection of extracts from his diverse works in new translations, with each extract accompanied by an introduction and notes. This format allows students to better understand this significant figure in the Early Church by providing an accessible representative selection of his works in one concise volume, making this an invaluable resource for students of Early Christianity. 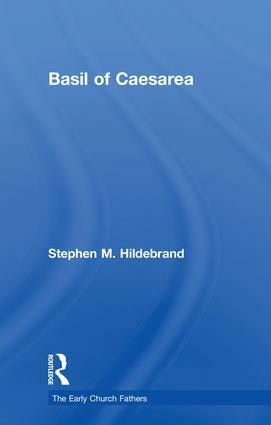 "In this volume Stephen Hildebrand gives a succinct yet insightful overview of the life and thought of Basil of Caesarea, informed by the latest scholarship, and offers a well-chosen selection of texts drawn from various genres and written for various purposes that illuminate different facets of the Cappadocian bishop’s activities and theology. Basil is presented as a complex figure who pioneered new Christian paths as a churchman, preacher, theologian, and ascetic while at the same time being deeply embedded in late-ancient Roman society. This book will prepare readers to delve into the broad secondary literature on this Cappadocian Father, and more importantly to read extensively the writings of St. Basil the Great himself." Homily on "I will tear down my barns"
Stephen M. Hildebrand is Professor of Theology at Franciscan University of Steubenville, USA. The Greek and Latin Fathers of the Church are central to the creation of Christian doctrine and the establishment of the Christian Church as a social entity in the first five centuries AD. Students of theology, religion, late antiquity and the early Middle Ages constantly encounter the names of these writers; yet most of them are dauntingly inaccessible to the student because of the volume of their writings and the relative paucity of available translations. This series makes available translations of key selected texts by the major Fathers, for the use of all students of the early church. Each volume is the work of a distinguished scholar and theologian, who has selected and translated the most representative texts of the author in question. Each volume contains a long introduction setting the subject in his historical and philosophical context, as well as a brief introduction and notes on the translations.